ON A SUNNY DAY IN JUNE, a group of teens who attend Eagles’ Circle, an alternative junior high at Rossbrook House, visited the U of M Bannatyne campus – most for the first time. 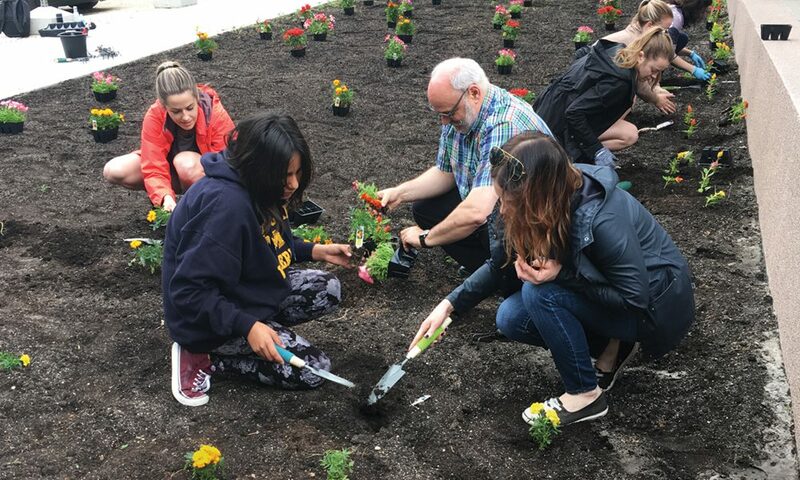 They and their teachers teamed with faculty and students from the College of Rehabilitation Sciences to plant a community garden of more than 200 colourful flowers. It was part of a project by the college and the Rady Faculty of Health Sciences’ newly established Office of Community Engagement to open up the campus to the neighbouring community. After planting the garden, the teens and their teachers joined Rehabilitation Sciences faculty and learners to share chili prepared by the college and bannock baked at Rossbrook House. Then they spent the afternoon learning directly from faculty and students about physical, occupational and respiratory therapy through hands-on activities. Like many of the projects initiated by the Office of Community Engagement, it was based on a partnership between the community and the U of M.
Weekend Inner-City Supervised Hoops) outdoor basketball program, the annual Biomedical Youth Program summer day camp, and mentorship of Indigenous high school students who are interested in the health sciences. Many community partners and organizations share their knowledge and expertise with Rady Faculty students. They accept students for service learning and volunteer initiatives; provide speakers to the U of M on topics such as food security, healthy sexuality and substance use; and offer Rady Faculty students opportunities to participate in innovative programs such as the WISH (Winnipeg Interprofessional Student-Run Health) Clinic and CanU, an after-school youth program. This past year, more than 480 students from all Rady colleges took part in on-site learning during orientation and 220 first- and second-year medical students participated in service learning at 31 different agencies. Second-year medical student Maira Ahmed said volunteering with Let’s Talk Science, a program that delivers science learning to kids, introduced her to people from all walks of life. “These kinds of opportunities truly complement our learning in the classroom. It’s also another way we can live out our responsibility to give back to the community,” she said. In March, the Office of Community Engagement held its first Community Partner Recognition Breakfast, a “thank you” event attended by about 100 guests. Vinh Huynh, principal of Hugh John Macdonald School, spoke at the gathering, recalling how Rady Faculty volunteers helped his nearby school complete a mural. Huynh expressed his hope that if kids in the community get to know the Rady Faculty of Health Sciences through such positive interaction, some of them will become the health-care workers and leaders of tomorrow. “It all starts just by feeling welcome,” he said. That’s music to Cook’s ears. “It’s important to recognize that as an institution, we’re not an island – we’re part of the fabric of the community and the wider city,” she said. To Ian Whetter [B.Sc./01, MD/05], director of the Office of Community Engagement, it’s not only important to recruit under-represented populations to the health sciences professions, but also to create an understanding of the ethos of social accountability among current students. “We want to strengthen those bonds with community members and partners and, through activities like experiential learning and volunteer opportunities, enrich our students’ life experiences. We have lots of book knowledge, but what we need more of is heart knowledge.